Have you ever had a delightful experience filing a support “ticket”? If you’re like most people, probably not. What follows is a guest post from Stephen Nguyen (above left), a developer evangelist at Iron.io. Based in San Francisco, Iron.io is a 25-person company that offers a cloud infrastructure platform that helps startups, growth companies, and enterprises build distributed applications and microservices quickly and operate at scale. Customers can run thousands of tasks in parallel to do things like crawl the web, process big data, send out mass notifications, and more. By migrating from a “ticket” to a “conversation” based support system with Intercom’s customer success software, Iron.io opened the floodgates to customer communication – mostly frustration – but ultimately achieved a net result of time, money, and sanity saved. Have you ever been so frustrated with a company’s support process that you didn’t even bother filing a ticket? Ironically, by not filing a support ticket the company in question receives positive reinforcement, because problems and dissatisfaction never hit their dashboard. I’ve observed and analyzed the support offered in the SaaS space for the last two years and the ability to connect on a support issue varies widely. In extreme cases you might even conclude some companies intentionally make it challenging to file a ticket. Previously, we used Desk.com for our helpdesk needs. The customer workflow went like this: a user had to click a button, then fill out a web form with background information, then send detail on their issue, and then hit “enter” to send the bug report off into the unknown. We weren’t receiving many tickets, which felt good, but we also noticed a stagnant churn rate. It was puzzling. Finally, after a lot of company soul-searching we decided to run an experiment: what if we made it dead easy for customers to interact with us? Could that reduce churn? This was how Intercom came into the picture. 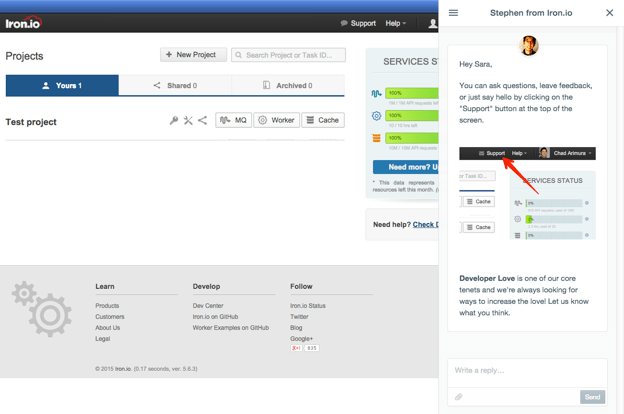 After installing Intercom we added an in-app button to a prominent place in our dashboard. Clicking on “Support” immediately opened an in-app conversation with someone on our customer success team. Because it was so easy to contact us with a problem, as expected, we were inundated with all sorts of customer frustrations. We believe it’s because the psychological barrier of filing a ticket is much higher than for selecting one button and typing into a chat-like interface. The reaction was dramatic and almost immediate. 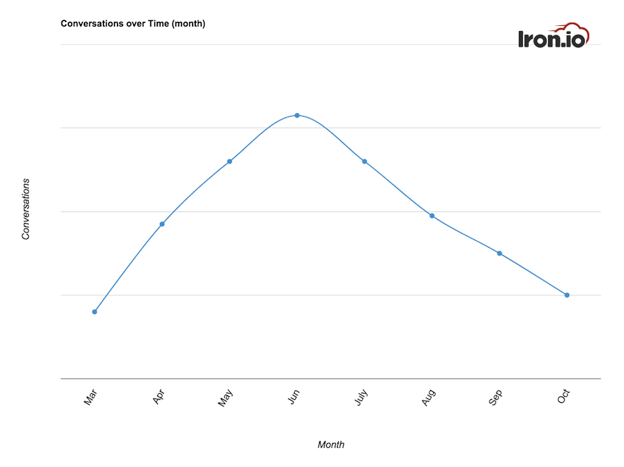 In July you can see the number of inbound conversations begin to drop and then level off at a manageable rate by September. As a result, we’ve been able to hire more selectively for our success team, more out of a perfect fit than a desperate need, all the while maintaining or even increasing speed of response and customer satisfaction. I think this is quite unique for a fast-growing startup. In July, I spent some time coalescing customer responses. The numerous interactions allowed us to identify repetitive bugs and common annoying issues that wouldn’t have been reported through Desk. It was easy to see patterns in feedback and feature requests. I presented the high-level findings to our Operations lead, who was extremely excited to see the feedback and ended up releasing some nice updates. For example, we had a condition where a user would see a line in the log that would say “killed” on a particular error. This would confuse the user and our support team. We were able to work with engineering to identify the cause and create a smoother experience for the end user. A lot of other feedback went to inform our UI/UX changes to our dashboard, leading to a much more user-friendly portal. Now my experience as a developer evangelist is so much more positive. More often than not, I’m dealing with happy, engaged users who want to provide interesting feedback, rather than frustrated users. #question – tag for very simple questions. Over time it’s easy to spot questions that get repeated and may be worth addressing another way. #problem – for the more time-consuming technical issues. If we see certain commonalities here, it might require programming work. There are a few more, but these are the most important buckets. At the end of each week, I scan all the tagged conversations and can quickly identify broadstroke trends to report up. Since August, when we fixed a bunch of common gripes with our product, most conversations contain constructive #feedback or interesting #feature requests. As a team, we’re no longer wasting time repeating answers to simple questions. Another challenge after switching over from Desk was convincing upper management that it was making a positive business impact. With tickets, the “number of issues closed” metric is still widely accepted by management, though it is losing its relevance in some circles. Whatever metric you use – number of tickets, conversations, swear words, etc. – it’s important to start with understanding the purpose of your customer success team. At Iron.io, our mission is to instill “developer love.” It sounds a bit too warm and fuzzy but it encapsulates the two-way relationship we want with users. We always want to keep in mind what we need to do to build and maintain customer trust. In return, we want customers to show appreciation for our services and support in ways other than just using our product. Ultimately we want our developers to feel listened to and cared for in all of our interactions; after all, Iron.io is a pretty high-touch product baked in to many of our customers’ critical workflows. We don’t want our customers to simply “put up” with minor grievances, we want them to share any and all concerns with us so we can continually improve. It’s a challenge bringing a delightful experience to an infrastructure service, but personalized messaging and consistent responses certainly help. At the end of the day, we aspire for an increase in positive conversations and a decline in negative ones (anything tagged #problem or #churn). Since moving to Intercom, we’ve seen an explosion in the number of “thank you’s” and other courtesies coming from customers. This has been the easiest way to prove to others in the organization that we’re taking the right approach when it comes to support and customer success. Create a positive feedback loop with your customer. Start by making it easy for customers to reach out to you for support and eventually those negative conversations will evolve into positive ones. Once you start a meaningful dialogue with customers and start to truly understand them, I think you’ll be amazed by how your perception of a customer changes. No matter what sort of inbox you use, keep it organized and TAG EVERYTHING. But try to limit your tags to no more than 10, for sanity’s sake. When it comes to creating onboarding messages, keep it short, and don’t waste your time making it pretty. Highly stylized emails are a dime a dozen these days. More personal, shorter, and relevant emails are much more welcome, at least in our experience. Want to give Iron a try? Our customer success team is waiting for you to hit the Intercom button and get in touch. 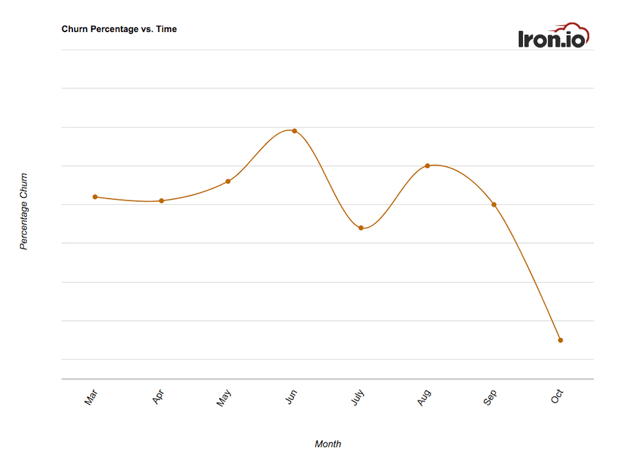 If you are looking to embrace the future of microservices, or build a distributed application with IronMQ and IronWorker’s remote task processing, Iron.io is giving readers 50% off their first three months on any paid plan. Start a free trial and use this link to redeem this offer, when you want to really see what message queues and asynchronous processing can do for your app.